10 v 10 + Keepers & 2 Crossing Players – The red attacking team look to pass quickly to a yellow corner player when attacking. 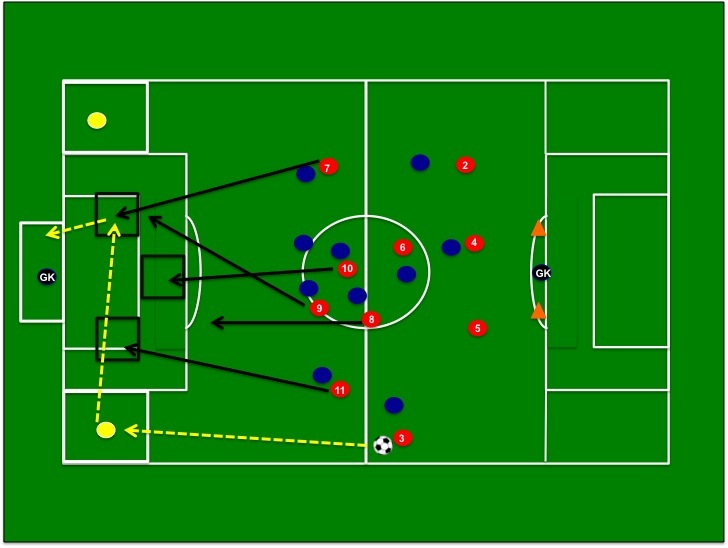 Once the ball is delivered to a “corner yellow player” the red attacking players will attack the three marked scoring boxes “marked out” in the penalty box. The red players can only score from runs into one of the three “marked” scoring boxes. The blue team will attack the red teams goal when they gain possession. Variations: Allow the yellow corner player to dribble towards the penalty box with the ball if needed – this will open up more passing options, allow yellow corner player to dribble in towards the box and score if needed. Key Points: have attacking players time their runs into the box, think of the cross as a pass to player into the box, the shot is the final pass placed into the net, make sure attackers vary their runs. Previous Post Pre-Game Shooting Exercise That Makes Sense!